This guide will help you understand how to efficiently and effectively do basic research. Research can seem intimidating at first, and can be the most difficult part of an assignment. In each case, the process will be slightly different, but there are a few basic steps that can be applied to most topics. 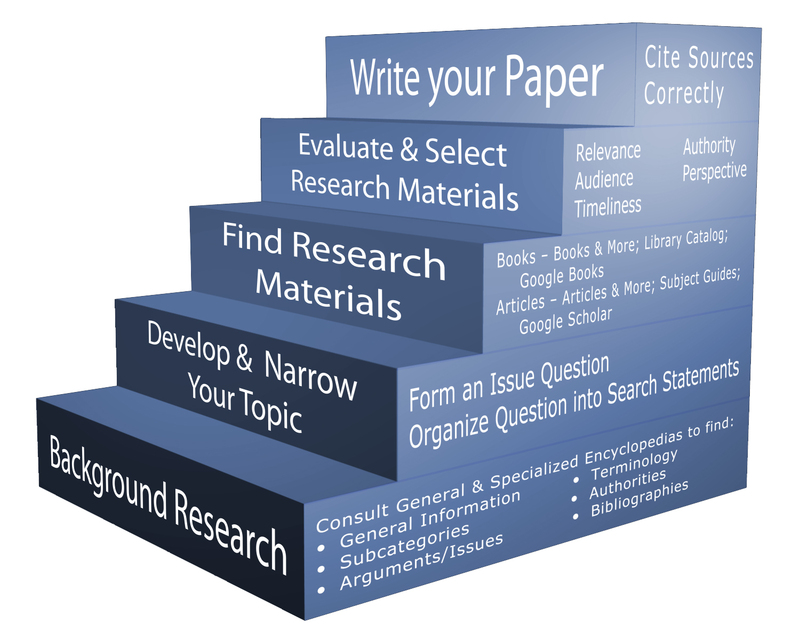 By following these simple steps, you will become a research expert equipped with the skills you need to locate articles for any paper or project. Remember, research is not a rigid process; many times it is more effective to move fluidly between steps. Research starts with a foundation of background knowledge and research on a particular topic. Use this research to identify key terms and concepts to narrow your topic and search terms. Click here for background resources and more information. Enter key terms and concepts into specific databases to find academic articles and other resources. Learn research tips and how to refine your results here. Books can be an excellent source of vast amounts of information. Click to be connected to the Library Catalog or for more information on finding books and other print resources. Academic papers require scholarly sources to strengthen your arguments. Find more information on evaluating an article, book, or website's credibility here. Once you have found your articles and sources, save them so you don't have to search for them all over again. Learn how here! Citations are a vital part of any scholarly paper or presentation. Make certain to cite your references correctly by clicking here to learn more. As you go through these steps, remember that the suggested layout is a very broad and general search strategy. The library has subject specific librarians for every catagory of major offered at BYU, and those librarians have put together pages just for you! On these pages, you will find databases they recommend you look in, as well as reference material, websites, and various other research helps. Perhaps most important is the subject librarians' contact information. If at any time you feel like you could use a helping hand in finding specific articles or developing your topic, contact your subject librarian for advice or set up an appointment to meet with them and talk through your research. To find topic specific databases and other resources recommended by your subject librarian, go to the subject guides!